Democrats Make New Bid To Require Donor Transparency : It's All Politics The latest version of the DISCLOSE Act, which would force donor disclosure on outside organizations that engage in election politics, is facing now-familiar opposition from Republican lawmakers. Senate Minority Leader Mitch McConnell speaks at the Faith and Freedom Coalition reception in Washington in June. On Wednesday, he appeared at a Senate rules committee hearing to oppose a campaign finance bill proposed by Democrats. Senate Democrats have rolled out this year's model of the DISCLOSE Act. Or, if you want to be more formal: the Democracy Is Strengthened by Casting Light on Spending in Elections Act. It's the third version of DISCLOSE since 2010. Broadly speaking, it would force donor disclosure on the big-money, 501(c)(4) social welfare organizations that are flourishing in post-Citizens United politics. Unlike almost all other players in an election campaign, 501(c)(4)s are not covered by the disclosure laws. Their donors are never publicly named. A Senate rules committee hearing on DISCLOSE on Wednesday made one thing clear: Republicans despise the bill. Previous versions of DISCLOSE all failed due to united opposition by GOP lawmakers. Chairing the hearing was Sen. Angus King of Maine, an independent who caucuses with Senate Democrats. He said political transparency is good for democracy, and compared the ads run by social welfare groups with debate at a New England town meeting. "No one's allowed to speak in a Maine town meeting with a bag over their head," King said, calling the town meeting "the purest form of political speech in our country today." "Who the speaker is, is part of the information" that voters and citizens use to evaluate political messages, he said. Senate Minority Leader Mitch McConnell isn't a member of the rules committee, but he came to bury the bill. "Let me be blunt," he said. "This proposal is little more than a crude intimidation tactic masquerading as good government." And that's the essential conflict. Liberals say the anti-corruption benefits of disclosure outweigh the free speech issues. They point out that the Supreme Court has agreed with that proposition, including a passage in the 2010 Citizens United ruling that allowed corporations to explicitly support and oppose candidates. Conservatives argue that the anti-corruption argument doesn't apply because the money is raised by outside groups, not candidates. They say that disclosure can lead to reprisals against donors, but it's acceptable for contributions to candidate campaigns. The Citizens United decision only endorses disclosure rules already in effect, they argue. On Wednesday, they also said too much disclosure would cause double-reporting of some activity and lead to less accurate data. And, of course, each side accuses the other of playing partisan angles. Democrats say Republicans, who used to support disclosure over restrictions on political money, are simply protecting their wealthy benefactors. 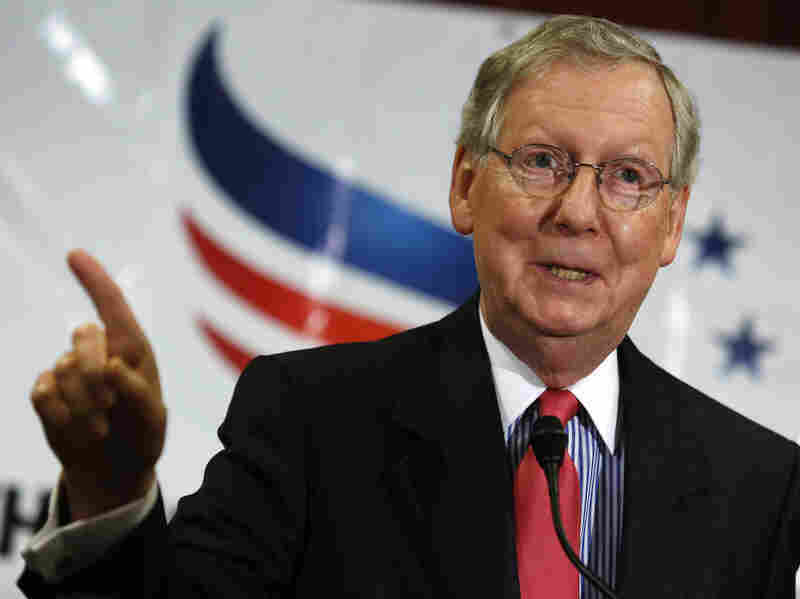 Republicans say Democrats are using the DISCLOSE Act to agitate liberal voters for November. The 2014 version of DISCLOSE would apply to 501(c)(4) social welfare groups, 501(c)(6) business associations, corporations and labor unions. If one of those entities spent more than $50,000 a cycle on campaign politics, it would have to publicly identify donors who gave $10,000 or more. The social welfare group Americans for Prosperity, the most prominent element of the Koch brothers' political network, has been running attack ads all year against Democratic senators and Senate candidates. That costs AFP about $44 million. A few of the ads actually ran late in 2013, so they wouldn't be affected by the DISCLOSE Act. But for all the other AFP ads, big donors would have to be reported to the Federal Election Commission.